New year, new sausages. So far in 2013 I’ve tried my hand at making two different ones. The first was an initial attempt at dry curing which unfortunately didn’t turn out well and had to be abandoned. 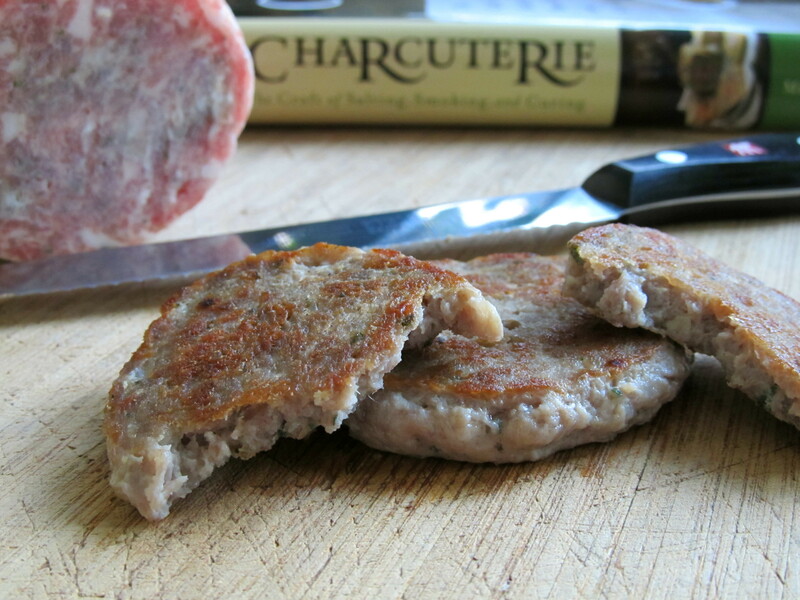 In order to regroup and give myself a boost of confidence I went back to an easier “ready-to-eat” sausage and made some sage and ginger breakfast sausage from Michael Ruhlman’s Charcuterie. A perfect recipe for washing away the stink of failure and a nice addition for our breakfast menu. So the big question was “links or patties”? For me it’s always answered “patties.” Even if I did have casings I’d have kept this breakfast sausage loose. It’s very easy to form a one pound sausage log, roll it up in some plastic wrap to keep the shape, and then freeze so you can just slice off perfectly formed patties whenever the urge for breakfast sausage overcomes you. The best part is breakfast sausage doesn’t take a week to cure in the fridge like my bacon. Instant gratification. This sausage tastes really, really good and passed the Cheryl test with flying colors. I even daresay she was pretty impressed. There’s a great ginger flavor and the sage doesn’t overpower, which was the one thing I was afraid of, since sage and ginger are strong flavors which will overwhelm a dish if you let them. Not so here. Very well balanced but more gingery than sage (which is fine with me as I like sage, but not too much of it). Early lesson from 2013…Sometimes keeping it simple is all you need to be successful. This breakfast sausage is a great way to both start your day and give a very good sense of accomplishment! Combine and mix all the ingredients together except for the water. Chill until ready to grind or set in refrigerator and chill overnight (I let it sit overnight). Using the medium holed grind plate, grind the pork cubes into a mixing bowl set in ice. When done add the water and mix well until it is absorbed and the pork gets “sticky.” If using a stand mixer it will take about 1 minute with the paddle attachment. I mixed by hand and found I didn’t need the full cup of water, about ¾ C did the trick. If the seasoning is to your liking roll the sausage into 1 lb logs, wrap in plastic wrap, and twist the ends so it retains the log shape. Put your sausage logs into the freezer. When ready to cook, remove from freezer, pull the plastic wrap back and slice off patties.